The Exeter Book is a 10th-century anthology of poetry in Old English and is of major importance to Exeter Cathedral, the Cathedral Library and English literature itself. Exeter Dean and Chapter Manuscript 3501, usually known as the Exeter Book, was written down by a single scribe – no doubt a monk – in about 970. It is one of the oldest items in Exeter Cathedral Library and constitutes the library’s foundation volume. 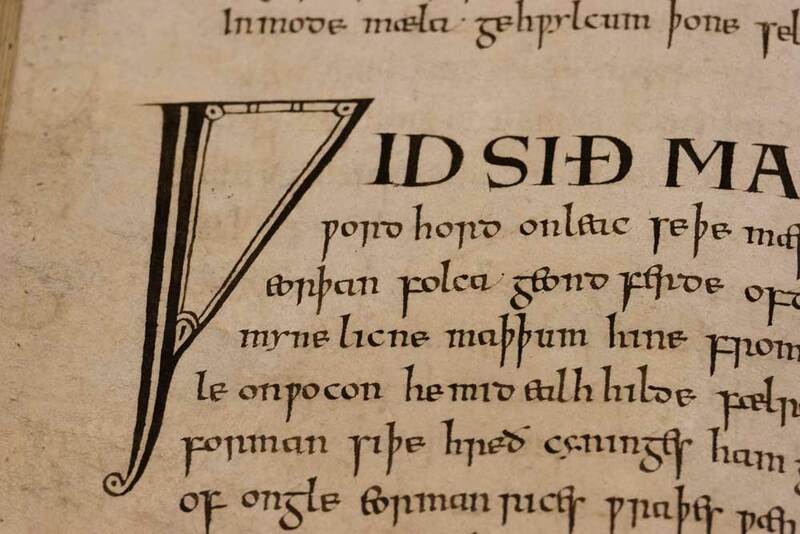 Its great importance lies in its contents and the language in which it is written, since Old English (or Anglo-Saxon) is the oldest form of English, which was starting to die out as early as the 12th century. The vast majority of medieval western manuscripts are written in Latin, so the fact that it is written in English makes it unusual in itself. Even more distinguishing, however, is the fact that it is a literary manuscript, specifically a collection of poems, a verse anthology. 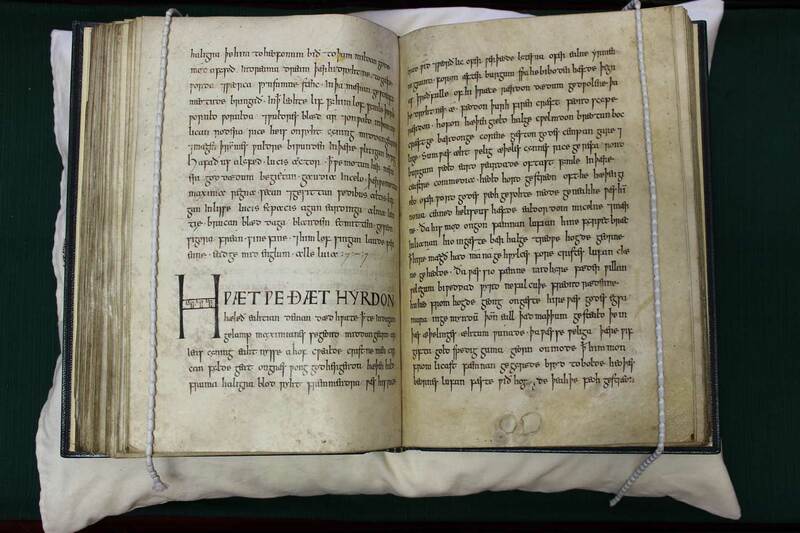 Most surviving Old English texts are in prose – the Anglo-Saxon Chronicle, for example – and there are only four known poetic manuscripts: the Beowulf manuscript in the British Library, the Junius manuscript in Oxford, the Vercelli Book in Italy, and the Exeter Book. Though incomplete and damaged in a few places, the Exeter Book is the largest, the best preserved and probably the oldest of these manuscripts. This means that what we have, here in Exeter, is nothing less than the oldest book of English literature in the world – a book of national, indeed international, importance and incalculable value. The Exeter Book was inscribed onto the UNESCO Memory of the World Register in 2016. 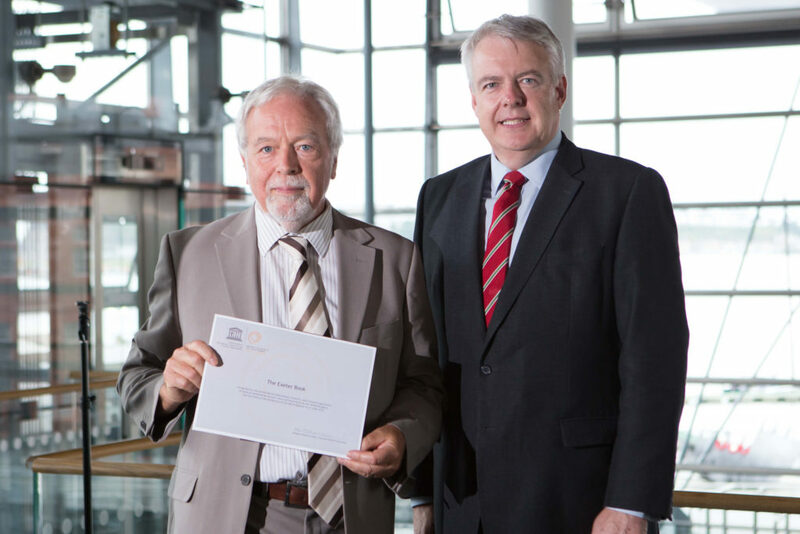 The image below shows Peter Thomas (Cathedral Librarian) receiving a certificate commemorating the occasion from Carwyn Jones, First Minster of Wales. The Exeter Book Project brings together the University of Exeter and Exeter Cathedral, with the shared aim of curating our cultural heritage for today and the long-term future.